Peter! You Got Some ‘Splaining To Do! ‘It’s just a jump to the left. And then a step to the riiiight! 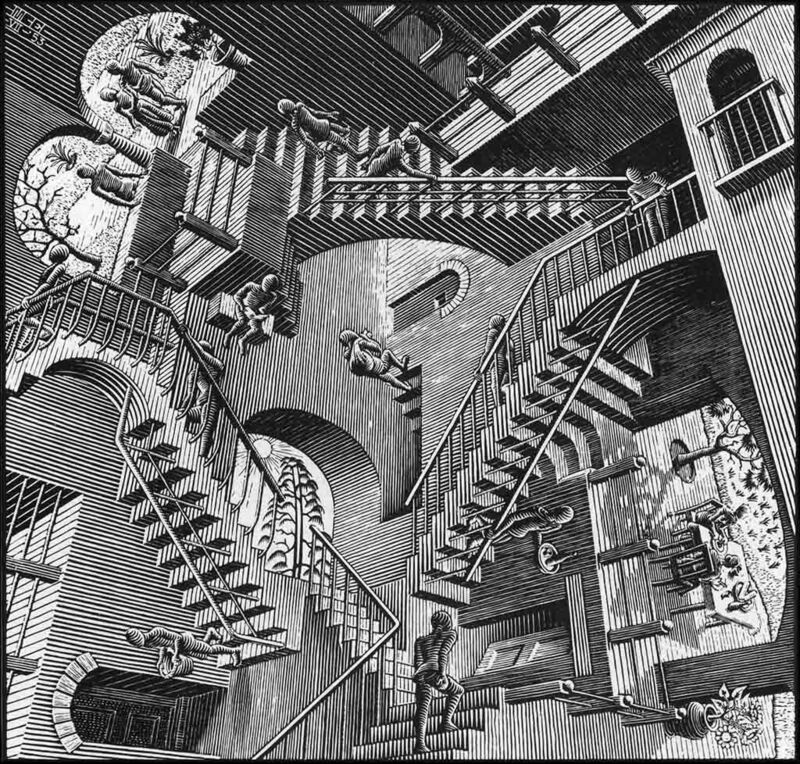 Escher’s Relativity – Pocket Universe? These are the episodes that make Fringe stand out for me as a serialized drama. Rather than jumping immediately into expected payoffs – Go NeoPeter Go! – the show takes the time to explore the interpersonal ramifications that arise from the weird Fringian Science the main cast members are subjected to week after week. Even better when Fringe places those beats against a SF motif that hooks deftly into the personas of the main characters, aiding and abetting them at this particular juncture in this season’s story arc. Throw in some funny, heartfelt, tragic, harsh, and sad moments with unexpectedly cool callbacks and I found this episode extremely entertaining. The episode is not without it’s puzzlements. Walter’s drive to find the next piece of the puzzle on his own makes Peter’s comments about Walter knowing better, unintentionally funny because Walter’s behaviour over the arc of the series contradicts that. Within the context of this episode, and to a lessor degree this season, Walter’s drive to solve the Observer Removal Riddle makes sense but it is in opposition to everything that has become before. Walter’s cavalier treatment of collateral damage Cecil – trapped in the Pocket Universe by his account for 5 days but to the outside world for 20+ years – is because of what Walter put back in his brain; the three removed brain pieces. With them back, Walter is afraid he will lose the man that Peter helped him to become. A more compassionate and caring one. The parallel between Walter and Peter was made even clearer in this episode. But where Walter despairs of hubris, Peter embraces it. He believes he is more capable than others and continues to deflect and outright lie about anything related to the piece of Observer tech he has placed in his head. Peter and Olivia Together Forever? Two moments stand out with Peter’s deceptions. The first happens in the opening act as an obsessed Peter has broken into Etta’s apartment to watch a hologram of his deceased daughter. Rather than easing his grief, Etta’s hologram fuels his fury. When Olivia shows up, Peter is hesitant to let Olivia see the hologram play. To watch the hologram the way Olivia thinks he is watching it, will dull the anger he has been stoking. Peter is not there to grieve. Olivia’s plea to Peter let her know when he is feeling down because she wants both of them to understand and share what the other is feeling; is tragic. Peter lies in his answer that he will, as Olivia works to try to avoid the same mistake she and Peter made the first time Etta was lost. Bookended with that moment is Peter calling Walter, ‘Dad’ and promising to be there for him. An empty promise to be sure. For soon, no doubt Peter will push everyone away from him. It undermines what should be a touching moment with sad helplessness. Ever alert, Olivia’s FBI and empathic skills are picking up clues ie the bandage on the neck, Peter taking off on his own and going incommunicado, and the kicker – Peter unerringly navigating them out of the pocket universe; that something is amiss with her estranged husband. Inner Child is with Walter and Donald! Woven into this is the return of the enigmatic Donald mentioned and seen briefly in The Recordist along with the shocker – and fan pleasing – the return of the young, bald child from Season 1’s – Inner Child. The implications of the Inner Child’s return are staggering and depending on when he left, or was taken from, the Pocket Universe he could be a child in 2036 or a young …Observer? Maybe even one we have met before? Maybe he needs a piece of tech that Peter has? What will also be interesting to see if the empathic bond Olivia and the boy had in Inner Child will come into play this season. Chilling. A, ‘Everything Is Proceeding As I Have Foreseen,’ perhaps look? Two shots chilled. The last one with Peter seeing everything in blue. And Windmark back at the body of the dead Observer looking like the cat that ate the canary. Maybe now we know why the Observers have been seemingly clumsy in their attempts to capture the Fringe team. An episode jammed full with character beats and SF genre tropes and shout outs. This was well shot, well acted, and well written. Olivia did not make a mistake in 2016, Peter left , she could not face the idea of finding Etta dead. 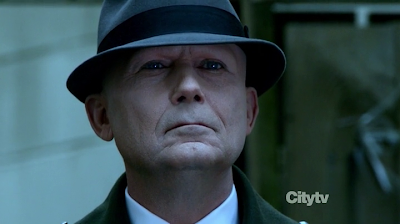 But as usual in Fringe the woman makes the mistake, the man is excused. Must be the reason why Olivia has to worry for Peter all the time, she has to feel guilty about 2016, and is not even allowed to have her own pain for Etta anymore, just to worry for Peter. The only characters that get writing are Walter and Peter, as usual. Olivia , years experience in Fringe FBI , and she has to ask How is that posible, and All Might Bishops know it all and do it all. Astrid and Olivia have to stand and admire them, at the end Olivia got the radio, and the best scene of the episode with the Observer. I loved everything Anna did this season, her dealing with Etta, and how she handles this part, but please give Olivia better writing in lines and in being pro-active. And Astrid, why are Olivia and Astrid not working in the resistence actively? I wonder what Wyman told Anna for this season, she was the only one at Comic Con not interested in Olivia but more in the big picture. Jackson and Noble knew all in detail, and clearly get what they want. Promo epi 7 3 x Olivia I worry for Peter in 30 sec, so more of the same? Even if Olivia gets an arc in epi 8, which I doubt, it will be too late, as Walter and Peter are already far ahead and not going to serve Olivia. Peter not the one with the brains and technical stuff. FBI agent or any kind of agent for the good cause in an pro-active role is in Olivias DNA. So if Peter wants to be the action hero, fine, but than Olivia should be the one with the technical stuff, the wires. The only real storyline Olivia has had since end season 3 was Peter, but at least she had FBI stuff to do. And Anna clearly clung on AltLivia who was active. Peter always has Walter and being the special one and the technical smart one mr Know all and has done FBI stuff. 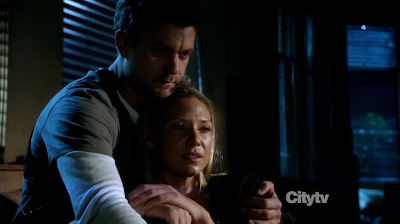 What Fringe made great was that Olivia had the man role like Anna Torv said so often, I wonder what Wyman told her about this season, some spin probably , and Anna naturally assuming that Olivia would always take a role in the resistence. Thanks for the comments. You’ve made your impressions on Olivia quite clear through these and your previous posts. Anything further along this line is simply comment retreading. Hope in future posts you will branch out to discuss other aspects of the show. Good evening. I really enjoyed this episode a lot. Great write up too. I am really loving your “episode patterns” that you include. I also enjoy your reference to Escher’s. Thanks. In reading we seem to have some of the same conclusions and observations. Peter’s ability to lie so quickly and easily was quiet disturbing. I agree with your “chilling moments” however, I actually felt there at the end when Olivia half smiles at Peter and then Olivia seemingly gets a rather cold expression, perhaps even fearful was just as chilling (to me anyway). I am frustrated by Astrid’s role this season, yet honestly if I consider it; this is reminiscent of Season One. In Season One, Astrid was more in the background and it was the main three. I am quite fond of Astrid, yet I have to admit that Fringe is really about these main three. And though I am frustrated with Astrid’s backseat this season, I understand why. We are simply going back to the beginning where it is our main three. I have thought of a few things I thought I’d post here. Perhaps these comments belong where the actual podcast post is. My apologies if this is the case. I thought of them actually after listening to the podcast for this episode and reading your post here. I then thought to actually comment after reading what all you wrote. I don’t know if anyone will mention this in the feedback as I haven’t gotten to that yet. As I was thinking of this episode and the importance of finding apartment 413, I suddenly wondered if this was a reference somehow to episode 4×13 “A Better Human Being?” Just the reference to that title alone seems appropriate given the circumstances. I too find that Olivia’s suspicions of Peter began in the pocket universe. The facial expression are a dead giveaway. Oh and this leads me to another thought. It has been mentioned a few times in the podcast conversation this season about Olivia having used up her cortexiphan abilities in Season 4 when she got shot; however, I have been wondering and am mentioning now – what about the abilities she had before? I mean we learned in Season 4 that she was being dosed and therefore supercharged with cortexiphan, but we saw abilities of hers in Seasons 1-3 that was long after the cortexiphan experiments she underwent as a child. So, wouldn’t she still have some of those abilities there – the ones that were triggered by a heightened emotional state (namely fear)? This is something I wonder. Also, I have been theorizing since Etta’s death that every time Peter does something irrational or “goes off the rails” that this is somehow triggering these Etta Resist signs/posters to appear as they do show up after one of his “rants.” Then I had a thought that perhaps when Peter makes these irrational highly emotional decisions that it changes the future somehow and these signs are part of that change. THEN I got another idea – perhaps Olivia is causing these signs/posters to appear. When Peter abandoned her, leaving her alone in the alley in “An Origin Story” is when we first saw the Etta Resist posters. Then after Peter tells her to go ahead to the monorail, in essence leaving her alone/abandoned again, we get the big Etta Resist sign on the building. I may not be on track as to how this works, yet I am really leaning towards Olivia now being the key to those signs/posters. We know from her memory recollections this season that Olivia’s are somewhat different, perhaps she is somehow manipulating time or creating … I don’t know. Just a thought. Well, these are a few things I thought I’d toss out there. I know it was long. I am wordy, sorry. Thanks for your posts! Good thoughts, Kristin! I really like your 413 tie in to episode 4.13! Lots of great feedback in your post. Thanks for taking the time. I really like your take on the room number – 413 – tying into the episode title from last season. Best I could come up with is it adds up to 8 – which is very close to the Infinity symbol. I wonder the same things about whether Olivia has retained any abilities or, even worse, deciding to inject herself again to save/heal Peter in some means. Your sign idea is also intriguing. For now, I feel they are a dramatic device used by the show to drive home intended emotional beats much like the score. Last thought, if Windmark’s last shot with his satisfied look is an indicator that the Observers are manipulating/monitoring events in a way that facilitates Peter’s transformation then that would explain why the Observers have been seemingly ineffectual at capturing the Fringe Team. Thanks again for your great and varied feedback!